Over the years, pre-workout supplements have changed to keep up with peoples’ evolving demands for energy. So long as human beings struggle to break boundaries, smash records and ignore limits, there will be a need for products that take us to our edge. As we grow, so does our desire for supplements that can help us become better versions of ourselves. For those fighting to be their best every day, being a half-step faster or one rep stronger means all the difference in the world. We looked at the history of pre-workouts and their incredible evolution from black coffee… to the new One More Rep™. If you really want to take pre-workout supplements all the way back to the beginning, the very first pre-workout was coffee. Bodybuilders in the 60s used coffee as a pre-workout due to the beneficial effects of caffeine. Many people today still share the practice of drinking coffee before a workout. In the early 1990s, everyone was looking for energy. The more extreme the better— especially for energy drinks or performance supplements. There was an assortment of different products all designed to pump you up with energy, but most were loaded with sugar and caffeine. When creatine was first popularized in the 1990s, it sparked a whole new level of interest in sports nutrition and pre-workout supplements. Since creatine yielded noticeable results, it rapidly became one of the most popular pre-workout supplements amongst athletes and bodybuilders. The most sought-after creatines — then and now — are blends. 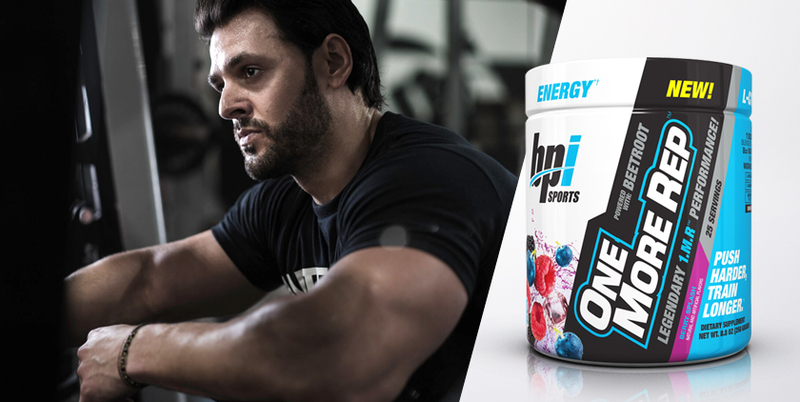 Whether the blend features multiple forms of creatine or additional ingredients, they all help to enhance the effect of pulling water into the muscle cell. In 2009, the original 1.M.R™, short for “one more rep”, embodied a philosophy of perseverance in training. To the early adapters, it felt like an insurance policy for your training that guaranteed the best return on your investment of sweat equity. After the birth of 1.M.R™, the phrase “ultra-concentrated” was born, along with an entire generation of athletes turned on to the challenge of pushing the limits of the human body. Wanting more from their workouts, their sport and their lives, athletes at every level rallied behind 1.M.R™. The “one more rep” mantra was 100% in line with this demand… always pushing for more. Times change, but people still want energy from their pre-workout supplements. Only now, they want energy that lasts and doesn’t result in jitters or a crash. People want natural alternatives to stimulants. They want products that are going to support and sustain their healthy lifestyles, not just their rigorous workout routines. The all new One More Rep™ is an answer to these demands. This formula stays true to our roots, bringing back the qualities that made people fall in love with 1.M.R™ in the first place, while propelling us into the future by evolving to meet the needs of today’s most discerning athletes. On-trend ingredients work synergistically in the body to provide powerful results and benefits beyond energy. The beet is an antioxidant-rich vegetable that naturally contains nitrates that increase nitric oxide in the body. This may increase muscle pump during exercise, endurance and performance. Carnitine is a fat transporter, increasing the amount of fat cells taken to the mitochondria, where they are burned for energy. This may support weight loss efforts and help boost performance. Because of citrulline’s ability to support cardiovascular health, it may reduce muscle fatigue and promote endurance. Citrulline may also relieve muscle soreness. Betaine has been studied as a performance enhancing compound. It may support athletic performance and muscle endurance. In addition to these beneficial ingredients, One More Rep™ contains no artificial colors. The red color of the powder comes from the natural red color of beets! The formula is beta alanine and creatine free, which means you won’t experience the tingles, and it is safe to stack with other supplements. Choose from four delicious flavors: Hurricane Orange, Raspberry Tea, Fruit Punch and Berry Splash.